Almost seven out of ten public colleges and universities provide so-called “merit aid” to at least five percent of freshmen who lack financial need, according to a new report from New America’s Education Policy Program. The report finds that about half of these institutions provide merit aid to at least 10 percent of freshmen without financial need, and nearly one in five provide this aid to 20 percent or more of their non-needy freshmen. 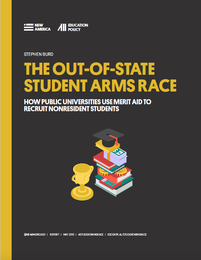 The report, entitled “The Out-of-State Student Arms Race: How Public Universities Use Merit Aid to Recruit Nonresident Students,” examines the use of non-need-based aid at 424 public four-year college and universities. The study reveals that this practice is not limited to the flagships and major research universities. In recent years, many state regional colleges and universities have been playing the merit aid game as well. Public colleges that provide substantial amounts of merit aid to students tend to enroll more out-of-state students than those that provide little of this aid. Public colleges that provide substantial amounts of merit aid have experienced a larger drop in the enrollment of in-state freshmen since 2000 than those that provide less. 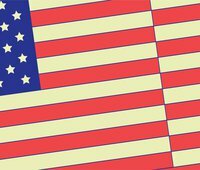 Public colleges that provide substantial amounts of merit aid tend to enroll fewer students with Pell Grants and charge low-income students a higher average net price -- the average amount of money that students and their families have to pay after all grant and scholarship aid is deducted from the list price – than those that provide less of this aid. But over the last 20 years, state disinvestment and institutional status-seeking have worked together, hand in hand, to encourage public colleges and universities, to adopt the enrollment management tactics of their private-college counterparts. For many of these schools, that has meant using their institutional aid dollars strategically in order to lure affluent out-of-state students to their campuses in order to climb up the rankings and increase their revenue. “As a result, these institutions are awarding fewer institutional aid dollars to in-state students who come from less-privileged backgrounds. The trend is also alarming in light of recent research that has found that the more out-of-state students a public research university enrolls, the fewer seats it has left for low-income and minority students,” says Burd. In other words, by bringing in more and more wealthy nonresident students, these colleges are increasingly becoming bastions of privilege. “Somewhere, Justin Morrill, whose legislation during the Civil War laid the groundwork for public higher education, is turning over in his grave,” Burd says.